KO1DX: WHY is monitoring Mexico TV Ch2 important? Over the years I've learned (as have MANY others who are interested in 50 Mhz Radio Propagation) that monitoring 55 Mhz (and 45, 58,49 Mhz) Analog TV carriers is an important tool when hunting for long distance radio contacts in the 50 Mhz Ham Radio spectrum. It should be fairly obvious that if the "Maximum Usable Frequency" or "MUF" :-) is greater than 50Mhz that with a bit of luck and hunting around we might find those long distance "DX" contacts we tirelessly search for. The following is a brief case study in how this can be done, and how useful it can be. To give you a brief synopsis of how I am monitoring for Mexican TV (here after known as "XE" or "XETV") I'll list some of the hardware and software items I'm currently using and demostrate how they are used, as well as some followup comments and ideas I have on the subject. Please keep in mind that this is ONLY a case study in the usefulness of monitoring XETV. However, there are MANY such TV carriers still active around the world and similar use applies to them as well. Lets take a look at several ways of monitoring for these carriers. These methods are all fairly simple although some are more complex that others. The simplest method is to connect a radio capable of tuning to 55.250 Mhz (in this example) there are MANY others for example: (48.25, 49.75, 55.24, 55.26, and on up into the UHF range) XETV Channel 2 uses several different 'offsets' 55.24, 55.25, 55.26 Mhz. For this example we'll just talk about 55.25 Mhz for the time-being. So now we have a radio, and some 'feedline' (aka "Coax") connected to an antenna someplace. I have used many types of antennas, from Dipoles, to Loops, to Discones, to Yagi antennas. I've had the best luck using "Yagi" antennas. A simple 3 element 50 Mhz Yagi will do just fine! The primary reasons for using this type of antenna is that it provides some directivity. This means that in the direction of interest where the antenna is pointed we should have the most 'gain' from the antenna. Meanwhile other directions have NULL's and reduced gain the net effect of which all aid us in focusing the energy we want into our receiver, while avoiding unwanted signals and noise. Reducing noise, has the added effect of improving our detection of the signals we are hunting for. So we tune to the frequency we want to monitor and then we sit there and listen. Duh? Yep...that's it. With any luck we'll hear what are commonly called "pings". Pings are the effect of a meteor passing over 'someplace' and creating an 'ionized trail of dense particles which may reflect the distance TV carrier we're hunting for. These tend to be quite random for the most part. And while they are useful for some types of radio propagation, namely "Meteor Scatter" they aren't really what most avid "DX'ers" are looking for. But this is the initial sign that your system WILL work! So this is an excellent sign so far. "foEs" or "Es" is a layer in the ionosphere that is capable when packed with dense electrons, of reflecting radio signals back to earth one, or many times. THIS IS WHAT WE'RE SEARCING FOR at least at this point. These densely packed electrons are able to reflect radio waves long distances. A single hop typically is about 1000-2300km. (more or less). From where I live in Missouri it is about 2100km to one of the common TV Channel 2 transmitters I hear that is located in the Yucatan peninsula. This distance is perfect for monitoring for Meteor Scatter as well as "Es". So from here that is 176 degrees from North. THAT is where I aim my small Yagi antenna a lot of the time. An example of an "Es" type "opening" is while listening to 55.250 Mhz I may initially hear a few "pings" or a very faint steady carrier. This signal begins to build, sometimes gradually to a very strong signal. Other times the signal can just go from noise to instantly strong. Still other times the signal may 'waffle' up and down in intensity, Hams call this "QSB" which basically means your signal is fading from time to time. Based on the stability of this carrier, and it's strength this can help to determine how well the ionosphere is behaving (for what we're looking for). What we basically want is a SOLID, STRONG (or extremely strong) carrier. Here is an example of a fairly strong XETV "Es" propagated carrier on the right side you will see a display that shows the 55.250 Mhz Video carrier, and on the left side (top) is the 59.750 Mhz WFM audio carrier. (bottom) is spectrum analysis of the 55.250 TV carrier and it's offsets. So these are some VISUAL tools that can be used to help monitor LIVE signals that you are HEARING on the radio. They can all provide some insight into how strong the radio propagation is (at least to the transmitter sites). The KEY here, is that you know you are 'at least' getting as far as that transmitter. The downside yet is that you know for certain if you are getting beyond that. But there is a good chance that you will be able to. So this is a very important tool that I use DAILY. Some more examples of some "foEs" and even better (longer distances) "foF2" (which is a much higher layer in the ionosphere that reflects signals around 1.5-2x+ as far as foEs 'on average' per hop). Last night we had an 'opening' to South America as far south as Uruguay here. 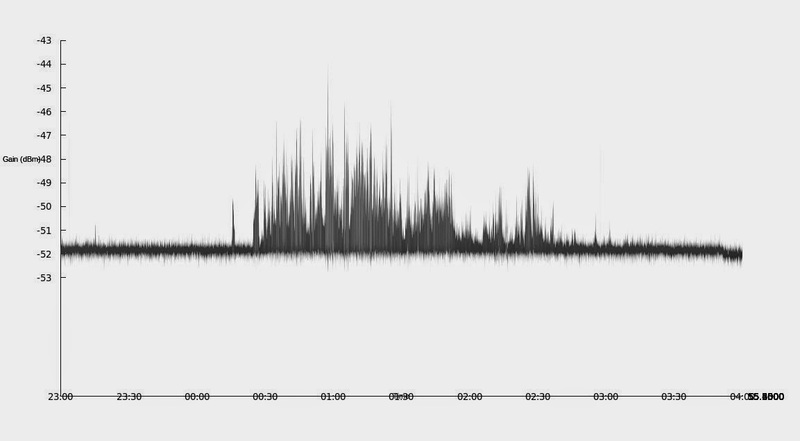 The following graph was created from power samples that came from 55.250 Mhz over about 4 hours in duration. This graph shows an initial brief surge around 00:15z, followed by another surge around 00:25z. Then between 00:30z and about 02:40z a fairly well sustained opening existed. In this graph you can see some of the "QSB" (fading) that can occur during such an opening. At 01:13z I contacted a ham via Morse Code located in Chile. His callsign is "CE2AWW". Here is a short video of that event. Referring back the graph above you can PLAINLY see that this contact was definitely 'aided' by "Es" around Mexico. The "MUF" was well above 80 Mhz into Mexico at this time. In my next post "Part 2" of this series I'll further detail how I currently monitor XETV. And how I intend to provide 'Automated' alerts to these types of events.